BASF Admixture Systems’ latest electronic tool models potential dollar savings producers can achieve with improved concrete mix consistency, a metric reflected in the need for little or no on-site adjustment of a load or changes to the casting, consolidating and finishing processes on a batch-to-batch or day-to-day basis. 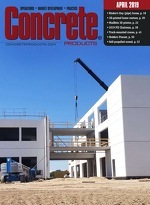 The Consistent Concrete Value Tool (CCVT) calculates an estimate from market data and producer inputs, including the effect certain situations that may occur on the jobsite have on the bottom line. “The final product is a value estimate that can be printed and utilized to demonstrate the savings that can be achieved with consistent concrete,” says BASF Product Manager Joseph Daczko. “The tool identifies ways consistent concrete can contribute to sustainable construction.” More than 125 CCVT and performance characteristics of BASF’s RheoTEC Z-60 workability retaining admixture can be obtained at www.basf-admixtures.com/rheotec.